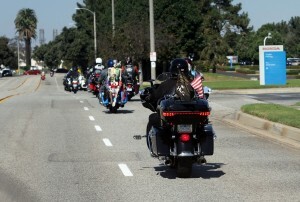 Kickstands up, engines revved and off they went for a 31-mile roundtrip ride to and from American Honda’s Torrance, Calif., campus. This time, it was more than just a weekend road trip. These 255 motorcycle riders came together on Oct. 21 at Ride for Kids, the longest-running motorcycle charity event in the nation. For 35 years, Ride for Kids has been raising funds for the Pediatric Brain Tumor Foundation to help children with brain tumors, which are the top cause of cancer death in children. The event also funds free educational resources, college scholarships for brain tumor survivors and emergency financial aid for families. American Honda has been the presenting sponsor of Ride for Kids for the past 27 years, and provided a Civic Type R for this year’s pace car. 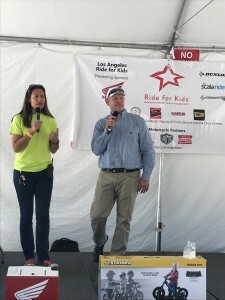 The Los Angeles ride raised more than $80,000 for the foundation, with American Honda associates Jeff Dwyer and Bill and Diane Boyer being recognized as top fundraisers this year. Silent and live auctions were added this year as additional fundraising efforts. After the riders returned, they participated in the Shining Stars Celebration, where they had an opportunity to hear from some of the “Stars,” or children affected by brain tumors, and their families. Having the ride start and end at AHM also brought out more than 30 Honda associate volunteers. New activities included tours of the Moto/Supercross team trailer, a skills event for 200cc motorcycles and lower, and a pumpkin decorating table from the Southern California Helpful Honda Dealers. 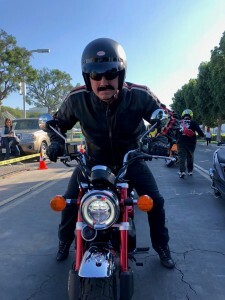 Chuck Boderman, vice president of AHM’s Motorcycle Division, rode the 2019 MONKEY this year, which is powered by a 125cc engine. Motorcycle Division Vice President Chuck Boderman rides a Honda MONKEY in this year’s LA Ride for Kids. According to Boderman, more than 130,000 children have received assistance through research, advocacy, and family support programs over the course of American Honda and the Pediatric Brain Tumor Foundation’s partnership. 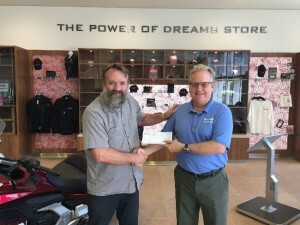 In advance of this year’s Los Angeles Ride for Kids, Special Tools and the Honda Library at AHM hosted a silent auction and sale, with proceeds benefitting PBTF. Several departments donated merchandise for the fundraiser, including Accessories, Auto Engineering, Auto Export, Motorcycle Accessory Development, Motorcycle Publications, Public Relations, Training and Warranty. The event, which took place in September, generated an impressive $15,915 for the Ride for Kids campaign.